An owl or an email marketing campaign? Which one works best for photography marketing? 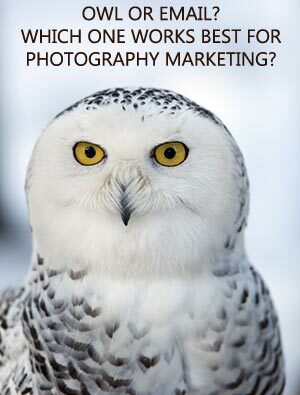 Although Harry Potter and his wizard friends happily use owls to ferry their messages around, that won’t really work out too well for professional photographers. Instead, you need something a bit more sophisticated, like a good email marketing campaign. 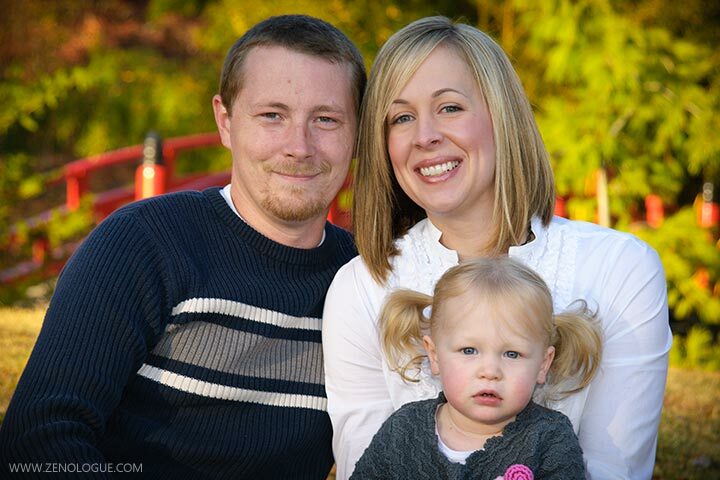 Today’s topic is how to create an email marketing campaign for your photography business. In particular, we’ll look at why email marketing is important and some email marketing campaign ideas you can use or adapt for your business. I’ll also share a couple of great resources to help you get the job done right and save you time in the process. If you could steal the TARDIS from Doctor Who and visit an earlier version of yourself, what advice would you have for the younger you? For me, this is a very easy question to answer, and I would make a bee line straight for the day I started my photography business here in Memphis. That was the day I would hammer home to my earlier self the importance of starting an email marketing campaign from day one. Of course, we can’t change the past, and like many other photographers, I ignored email marketing for way too long, not realizing I was forgetting to use the single most powerful tool we have in our marketing bag of tricks. Back in those early days, I suffered from the same misconceptions and broken assumptions that many business owners seem to have about using email to communicate with my potential customers. Although social media hadn’t really gotten into full swing back then, if it had then I’m sure I would have said that social media was going to kill email marketing stone dead. Clearly, that hasn’t happened and, when I look back at the rather blinkered attitude I had in those days, it’s enough to make me slap my head at just how dumb I was not to include email in my marketing strategy. I’m even more surprised at myself when I remember that I’m one of those people who actually enjoys marketing. So, I get it – for anyone who finds marketing less than thrilling, it must be easier still to leave email marketing out of the mix because it would only add more admin work when you would rather be out there creating photographs instead. One I learned from personal experience! Can an email marketing campaign prevent your clients from forgetting about you after working with you? You bet it can! A hard lesson learned! Back in 2008, I think it was, I had a fun and busy spring creating portraits in the Memphis Botanic Gardens. One of those clients was a lady, together with her husband and their young child. We created some lovely portraits, and I recall that she invested in a modest-sized canvas for the wall and a set of smaller prints for herself and to give away as gifts. When she collected the finished photographs, she was clearly thrilled with the results, so everyone went home happy that day. Here was one of my own happy clients asking for recommendations from her friends for a photographer, and she hadn’t even approached me to see if I was available, or to talk about what she was looking for. I actually sat there for a few minutes in silence, not sure what to think or do. Was she secretly upset about the photography we’d created before and didn’t want to use me again, or did she think it would be too expensive? After a while I decided speculation was pointless and the only way to know for sure was to talk to her, so I sent her a Facebook message to remind her I was there, and asked if she would like to talk with me about creating more photographs for her. I figured there was nothing to lose, and I might at least find out what it was I had previously done wrong to warrant being left out. Her answer was even more surprising. It turned out she wasn’t mad at me at all, nor did she secretly dislike the work I’d created for her previously – in fact, she still loved it. The hard and painful truth was, despite having had a good experience the previous time, despite having one of my portraits hanging on the wall at home, and despite being connected to me on Facebook, she had simply forgotten about me. Forgotten? How? Why? Was I really that forgettable? I thought she was joking at first, but she assured me that it simply had not occurred to her to call me, but that she instantly realized I should have been the first person for her to call on when I got in touch with her. We went on to talk about doing some photography of her child, which we successfully did about 2 weeks after we talked. A bullet dodged in that particular case, right? But the part that really hit home to me later on was when I realized that for every missed opportunity I did manage to catch, there are probably a hundred others just sailing by undetected by my radar. Not to mention all the business that had been lost because prospects had seen my website one time but then forgotten I ever existed when it came to time to actually hire a photographer. Perhaps if I had a system to help keep my photography on the mind of my prospects and clients, it might combat some of the apparent amnesia out there in the marketplace. I needed no further convincing about the value of using email. That was the day I decided to plug the hole and stop my photography business from sinking altogether by including an email marketing campaign as part of my overall marketing strategy. To more fully understand how email marketing can actually help your photography business, you need to know more of the story than just the simple fact that email communication helps people remember you more easily. After all, Facebook and the other social media channels can be pretty good at that too, if you know what you’re doing, which I obviously didn’t back then. Social media helps people remember you when your updates show up in their news feeds, so if being on top of their mind was the only benefit email marketing had to offer then we wouldn’t be having this conversation right now. In fact, the basic idea of staying on top of mind with your prospects just isn’t enough in and of itself to persuade people to book you as their photographer, as evidenced by the poor performance of Facebook and the other social networks in that area. Yet, despite everyone assuming otherwise, email marketing has consistently been shown to be one of the most effective marketing channels we have available. This is no longer a point of simple opinion, but a fact, as demonstrated in the impressive collection of statistics presented on the aptly-named website emailisnotdead.com. I’m sure there are more, but I can see 5 big ways where email marketing differs from other marketing channels. Firstly, email is a much more personal form of communication. Yes, I know we’re a long way from those heady early days of “you’ve got mail”, but an email still feels like something intended just for us. Sure, there’s a lot of spam around, but we’ve adapted very well to identifying it (both on our own and through our automated spam filters), and the spam that does make it through to our inbox is easily dealt with and consigned to the trash where it belongs. Thankfully, while spam is a nuisance, it hasn’t managed to destroy the overall need for email. Of course, we still have to decide whether or not to open the emails we receive, which is based largely on factors such as how well we know the person it came from or how interesting the subject line is. This is why email marketing is a slow relationship-based game – your job as a marketer is to earn the trust of the people you’re sending emails to, and that doesn’t happen over night. The second reason why I believe email marketing does a great job is it commands more attention from our audience than even social media can. Unlike the never-ending torrent of updates in a Facebook news feed or Twitter stream, an email is a singular thing and usually read in its own window, unless you have one of those preview-type setups. And, because the fundamental nature of an email is close to our internal mental label of “a letter”, we tend to assign a certain degree of importance to it, and thereby give it a bit more of our attention. I use the word “attention” there in the sense of giving the content the consideration and thought it deserves, but there’s another kind of attention that’s in even shorter supply. The other variety of attention is the simple act of “paying attention” and the idea of being fully present at the time of reading. For example, I’m willing to bet you’ve got a whole lot of other things going on while you’re reading this, and I wouldn’t be at all surprised if you have 10 or 15 other browser tabs open at the same time, and that your computer keeps distracting you with those rather Pavlovian notifications that demand your attention or else risk missing something. Even if you’re listening to the podcast version, maybe you’re driving to work or on your way to pick up the kids from school, or perhaps you’re busy editing the latest batch of images from a wedding or portrait session. It seems that our brains are just unable to single-task these days because we’ve become so conditioned to deal with a barrage of external stimuli – a real shame, if you ask me. Your prospects and clients are no different – they have a million things going on in their lives at any given time, and their undivided attention is probably the most valuable currency on the Internet! Getting enough of it to fully engage them can be a real challenge and that’s where an email represents a small but valuable moment of silence in an otherwise noise-filled world. The chances are very low of someone hiring you as their photographer, or buying from you, on their first encounter with your website. Unless you happen to be famous in your local community, the levels of familiarity and trust needed for them to make the leap and become a client are just not present in that first interaction. The problem with most photography websites and blogs is that they’re part of an open-ended marketing system where visitors arrive, look around for a bit, and then leave with little chance of returning any time soon. It’s a bit like a roadside billboard in that regard – traffic drives by, sees the message fly past, and then the next billboard comes along, and so on. Email marketing helps to fix that problem. When you get visitors to sign up to your email list, you can send them emails over time that (among other things) encourage them to return to your website or blog to view content they may not have previously seen. This mechanism turns the wasteful open-ended system into more of a productive semi-closed loop. I’ve already mentioned that repetitive exposure to your photography brand helps people become more familiar with who you are and what you do. That in turn encourages an increase in trust, but another benefit of the emails you send out is the creation of multiple touch points, spread out over an extended time. How does that help your marketing and, more importantly, your bookings or sales? To understand that, consider the chances of someone coming across your photography website or blog right at the moment when they’re actually ready to book someone or make a purchase. Statistically, it’s unlikely that you’re going to hit that exact point very often on the first visit. By putting an email marketing campaign to work for you, and increasing the number of touch points you have with your potential customers, you increase the chances of being there in front of them at the right time. Not only that, but your overall marketing message soaks in over time, as people read more of your emails and they become more engaged with you and what you have to offer. This is where we can use the idea of “warm” and “cold” prospects. It’s a bit like boiling a pot of water – the pot has to be on the stove a certain period of time before the water comes to a boil. Just putting the pot on the heat one time for a few seconds won’t do much for you. Likewise, taking the pot off the heat in the middle and then putting it back on means it’s going to take more time to regain the heat you lost. Email marketing keeps your prospects warm until they reach the point at which they’re ready to hire someone – hopefully you. Can you now start to see why you should rethink including email marketing in your overall strategy for getting new clients if you’re not already doing that? Even then, I know you might still have some reservations. I can understand that, but the reality is you don’t need to be a writer. You just need to be able to communicate with people in a real and genuine way. Does the issue of not being a writer stop you from emailing your friends and family? Of course not, because the formal rules of writing simply don’t apply to emails. In fact, the less formal and the more personable you are in your marketing emails, the better off you’ll be. Ah, yes, that might all be true, but I don’t want to spam people with emails they don’t want! Then send them emails they do want instead! No one likes to get spam, but your emails will only be seen as spam if that’s what they are. So, for example, if all you do is send hyped-up sales messages that look like desperate pleas to get people to book right now, the chances are that it will be seen as spam, and your subscribers will unsubscribe. On the other hand, if you send people information and content that will actually interest them or help them in some way, they’ll be more than happy to hear from you. Are you feeling a little better about email marketing now? 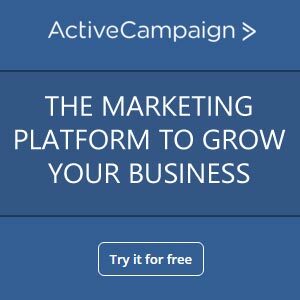 I have to disagree there – the technical aspects of setting up an email marketing campaign are really not that hard to overcome, and writing an email takes, what, about 20 minutes, tops? How does that 20 minutes compare to wasting the same amount of time on emergency marketing that doesn’t work? Look, I get it – you feel very busy trying to get your business going, but the one thing I’ve learned over the years is that the idea of “working smarter, not harder” might sound like a bit of a cliché, but it’s absolutely true. Being “busy” doesn’t always translate into actual achievement. It just creates the illusion of moving forwards when all we’re doing is spinning our wheels in one spot while everyone else is overtaking us. On that note, marketing your business requires work – some of it hard and the kind of stuff that’s boring and unexciting – but if you’re going to succeed you must be prepared to do things you don’t enjoy all that much, and just power your way through them so you can work more on the things you are passionate about. 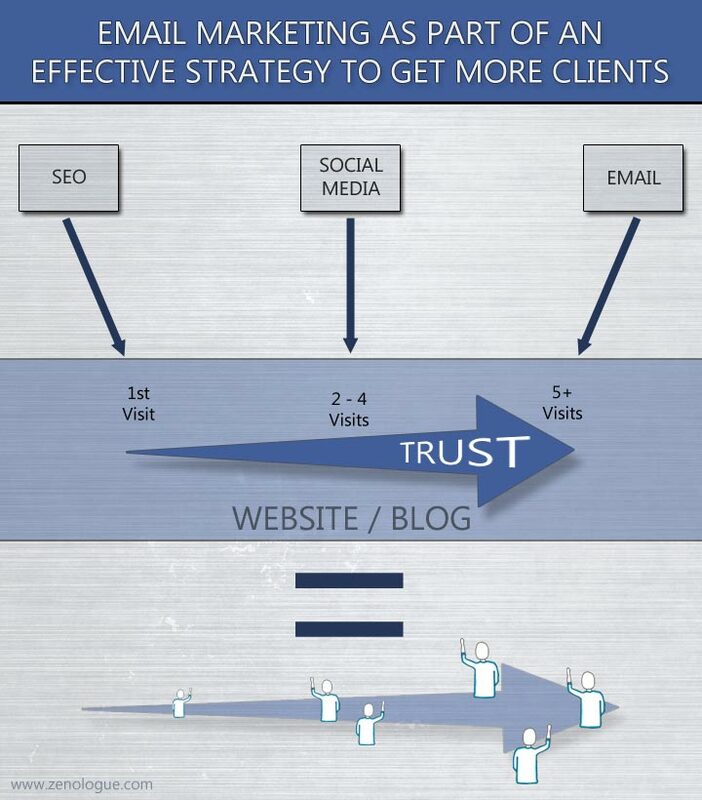 As you can see from the diagram below, getting people to hire you is based on trust, and that level of trust is earned over time – it’s not something that just happens the first time someone visits your website. While SEO and social media are great at attracting new visitors, they’re not so good at getting people to keep coming back for more. That’s where your email marketing campaign comes into play – you can communicate with people over time to lead them back to your website or blog for multiple visits, each time increasing the trust factor until they’re ready and comfortable hiring you. SEO and social media are good at sending visitors to your website, but they don’t generate many repeat visitors, which creates open-ended marketing. An email marketing campaign semi-closes the loop, resulting in more repeat visits, and increased trust over time. More trust and familiarity with your brand leads to more clients. So how do you actually go about doing this stuff? How can you create a simple email marketing campaign from nothing without driving yourself crazy in the process? There are a few pieces to completing this particular puzzle, but it’s not too bad if you take it all one step at a time, so I’ll break it down into more easily manageable steps. There are 7 steps in total, making it quite a simple process overall. Step number 1 is to choose an email marketing provider. They can handle the administration of your email lists, take care of who subscribes or unsubscribes, and of course send out the actual emails to your subscribers. Whatever you do, don’t try to handle this yourself! If you try to save money by not using a third-party email service provider, I guarantee you’ll run into all kinds of problems and could even end up with your website domain being blacklisted by just about every service provider out there, meaning that you’ll lose the ability to get your emails delivered to your subscribers. For the sake of a few bucks per month, it’s more than worth paying for a good email marketing company. But who should you use? Having chosen your email service provider, the next step is to set up your first email list. The purpose of the list is simple – your subscribers will be attached to your list with their email address, name, and any other information you collect when they sign up. Of course, you can have multiple lists if you like, and you can have the same people on more than one list, which can help to segment your audience, but you obviously need to start out with at least one list. Just give your list a name and create it – that’s all there is to it at the moment, and I’ll talk about how to add people to your list in a few minutes. Before you can do that, you need to create something your subscribers will want in exchange for giving you their email address. That’s what we call a lead magnet. Often called an “ethical bribe”, the job of the lead magnet is to give your audience a reason for them to sign up to your email list. Because someone’s email address can be considered a form of marketing currency, if you like, your lead magnet needs to be something they’ll find interesting and valuable. Although the most common type of lead magnet is an eBook, there’s no rule that says it has to be that, and it can be almost anything. Unfortunately, this is where so many people seem to hit a wall, but for all the wrong reasons! It’s natural to imagine we have to give our new subscribers something really amazing, which helps of course, but the other assumption is that it has to be big, or look super-impressive, which can actually be counter-productive. Let’s say you want to offer your new subscribers an eBook with tips on what to ask a wedding photographer before deciding who to hire. The temptation is to think people expect to get something with a lot of pages – I suppose because we tend to think of it as a “book” – but if you create something too big, no one is going to read it all the way through. Going overboard to create an epic guide just isn’t necessary at this stage. If you think about it, your subscribers just want some quick answers to a few important questions, and they don’t have all the time in the world to go through a big book. In some cases, a simple but comprehensive checklist or “cheat sheet” can suffice, although I’ve found that a short eBook of around 8 to 10 pages works very well. The one thing your lead magnet should have is a call to action, preferably repeated several times throughout, to get your subscribers to take the next step toward working with you. There are several options for this, but the most common is to simply store it in a folder on your website. You can also use a cloud-storage option, such as Amazon S3, which is the method I recommend if your lead magnet is a video file or other large-sized asset. For videos, you can also make use of Vimeo Pro, which is the professional version of the popular video-hosting service, but which allows you to protect your videos and make them completely private and accessible only by their URL. Whichever option you choose, all you need to do to get your lead magnet into the hands of your new subscribers is to give them the URL where they can access it. This is where the welcome message comes into play. This is a special email you create that’s attached specifically to your new list. The welcome message is automatically sent to all of your new email subscribers as soon as they sign up, and this is how you will deliver your lead magnet to them. The welcome message is also important because you can let your people know they’re in the right place, show them where and how to access your lead magnet, as well as laying the foundation for your future email marketing campaign by explaining what they can expect from you going forward. Managing your subscribers’ expectations at this point can go a long way toward keeping them happy and reducing the unsubscribe rate in the future. For example, if you plan on sending an email each week, on a Tuesday, let them know that’s what they can expect, rather than hoping they’ll just pick it up as they go along. Most people will stop at this point, assuming they’ve got everything covered, but there’s another important element you need to have in place that can really help cement the new relationship with your email subscriber. Email service providers such as iContact allow you to redirect your newly-subscribed contacts to a special page on your website as soon as they subscribe. This is called the “thank you” page, and its purpose is exactly as the name suggests. This is a page you create on your website that sits outside the normal navigation and is designed to be ignored by the search engines. You don’t link to it from anywhere else on the site, so the only real way people can land on this page is by subscribing to your email list. You can use this page to thank people for signing up, to reassure them that your lead magnet is on the way to them, and what they can expect to get from you going forward – essentially the same things you would include in the welcome message, except that you don’t provide the lead magnet download link on the thank you page. However, you can take this a step further, by presenting a new subscriber special offer, or providing something of additional value. You might even have a low-cost product for sale. The idea here is to get your subscribers used to interacting with you, so that they’ll be more likely to follow your calls to action in your regular emails. That still leaves the question of how to actually get people to sign up to your email list. To do that, you’ll need to use a sign-up form, and most email service providers allow you to create those in their system and then deploy the HTML code on your website wherever you want to use it. The main issue with most sign-up forms is they don’t look all that attractive, and you might need to alter the style of the form on your website by adding some custom CSS code in your style sheet. Alternatively, you can use one of the many opt-in plugins available to create better looking sign-up forms that integrate with your service provider. This is really the only technical step in the whole process, but it’s not that hard to overcome, and you can always find someone to help install the sign-up forms if you don’t want to get involved with it. Finally, you’ve got everything in place, and all that’s left is to send out your regular emails – I refrain from calling them newsletters because the last thing people really want is another business newsletter. How often should you be in contact with the people on your list? I recommend once a week, not the once per month option that most people seem to want to default to. A monthly email sounds attractive and perhaps less intrusive, which appeals to those who are scared of being seen as spamming their list, but the problem is people will be more likely to forget about you in between emails. Once per week means you can send a couple of information-based emails each month, and one that tells them about an offer, event, or promotion you might be having. As long as most of your emails are packed with useful and interesting information, they will be well received, and you’ll be able to get away with the occasional sales-oriented email. Another question I often hear about this has to do with which format to use – HTML or plain text emails. My answer is almost always to use the HTML format so you can take advantage of the tracking system to monitor open rates and click through rates etc. but to only send text in those emails. Yes, I would avoid using those pretty HTML templates that seem so tempting for the simple reason that a fancy template full of graphics will immediately make your email look like a business email and rob it of your personality. Think about it, you don’t usually use pretty templates with lots of graphics to email your friends and family, do you? The same goes for your clients and prospects. Consider the fact that you’re in a people-based business where personal interaction is an important element. Your clients have to know, like, and trust you before they will hire you, so putting your email communication on a formal business footing is likely to be counter-productive in that situation. Yes, there are businesses that can benefit from using a more formal style of email, but I don’t believe photography is one of them, so I recommend that you stick with simple text emails and an informal writing style, at least until you’ve gotten used to how all this works and you can experiment to test different formats for yourself. Obviously, email marketing is a vast topic, and we’ve just scratched the surface here to at least get you started. There are more advanced elements we could talk about, too, but I think those might be better off as a subject all by themselves. Before I close here, I want to make sure you know there’s a really great interview on the Photography Marketing Masters podcast with email marketing expert Ian Brodie, the best-selling author of “Email Persuasion“. I highly recommend you take a listen to his interview and then get his book – it’s the best guide on the topic that I’ve seen, and Ian has a really useful private Facebook group to support the book where he personally answers questions from readers. To summarize what we’ve covered here today, email marketing is still one of the most powerful forms of marketing you have at your disposal, and you could be losing a lot of potential clients if you’re not using email to court them.